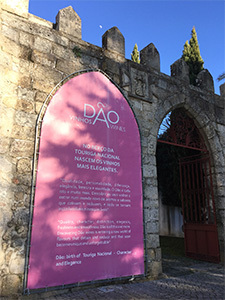 Dão is one of the oldest Portuguese established wine regions, situated in the centre of Portugal. It takes its name from a rocky river (Rio Dão) that crosses this territory. Dão wine is produced in this mountainous region with pine tree forests and with a temperate climate. The region became a Denominação de Origem Controlada (DOC) appellation in 1990. The Dão region is the origin of the Touriga Nacional wine grape variety which is the principal component of Port wine. The Tower of Gandufe sets into an architecture pattern applied to the manorial residences of Portugal after the late XII century, having its peak during the XIII century and known as “Domus Fortis” in Medieval times. Although its purpose would be more civil than military, these manor houses were associated with fortified structures, clearly inspired in the donjons of the castles, being essential to have active defence elements, such as loopholes, balconies with boulders and its top crowned with outstanding parapets. The fortified houses where the tower is prominent and intimidating, secured the continuity of the noble secondary lineage, not only over rural populations but especially among the ancient lineages, who owned castles and are very much conscientious of their power. These constructions are outside the urban zones, adding a special value to the rural way of life, normally occupying smooth hillocks between agricultural valleys. The purpose of this was for the landowners wish to be nearer their estates, without neglecting the minimum necessary security. The Tower of Gandufe built with pared granitic blocks, is a good example of that, appearing in the middle of a valley with strong agricultural potentiality. It has a square shape (8,70m x 8,60m), already partially truncated, having three different floors and is covered by a foursided roof. In each floor there is only one compartment. The access to it would have been trough a door located at the second floor’s level and a movable wooden ladder. The access to the other two floors and to the roof was done from the interior, also trough a wooden ladder leaning against the western elevation. Possibly there used to be an out-building attached to the south wall. This outstanding structure, a symbol of the consolidation of the rising of the medieval Portuguese small and middle class nobility, was originally part of the ancient council of Senhorim. A popular tale attributes its construction to the “Moors”where a noble called Gandwolf lived and was a rival of Azurão, the owner of Azurara’s land, today partially integrated in Mangualde’s council. 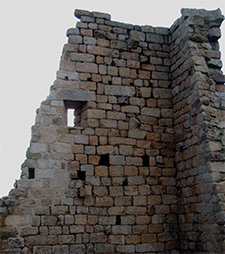 The most ancient allusion to Gandufi appears among the inquiries of the king D. Dinis, leading to the conclusion that, by this time (XIII century) the tower already existed.